War can be cooperative. Kinda. A lot of very profound things have been said about war. Perhaps the most meaningful is this super accurate quote from philosopher Jackie Chan: "War, hoo, yeah, what is it good for? Absolutely nothing." Wait, is that right? Bah, no time to fact check. 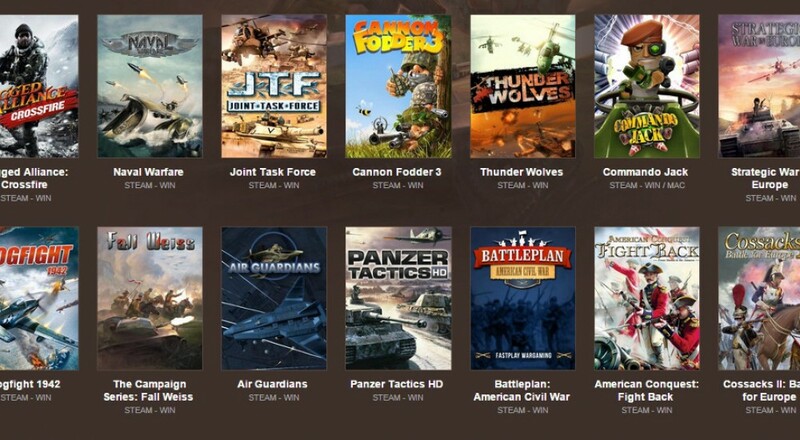 A few hours from now, this epic war games bundle will go up in price. Less time quoting, more time fighting. The real answer to the quote above is "War is worth $2.49", because that's exactly how much the Victory Mega Bundle from Bundle Stars costs. 14 Steam games total, all of them centered around the strategy and explosions made famous by war. The catch is that after the first 48 hours, the price jumps up, making war good for a little more than the above price. Er, worth less. Wait, that metaphor completely breaks down if you think about it for more than half a second. Oh well, no time to write a better one. Price increase impending and all that. Included in that big list of war games are a handful of co-op titles, listed below. Even if they don't have co-op, many of them do have multiplayer, meaning you can still jump online and annihilate people with your virtual weaponry. Naval Warfare - Epic strategic warfare on the sea for local co-op players. Joint Task Force - Heavy-hitting real-time strategy with both local and online co-op support. Cannon Fodder 3 - Comedic tactical action with four player online co-op. The Campaign Series: Fall Weiss - The successor to Panzer General with local and online co-op play. Dogfight 1942 - War in the sky for local co-op players. Strategic War in Europe - Deep strategy for co-op players near and afar. The Victory Mega Bundle delivers all 14 games via Steam key for one flat price. The amount bumps up after the first 48 hours, so click through and check the timer at the top of the screen to see just how much war is going to set you back. *Update* - It appears Cannon Fodder 3's online support is no longer functional since Gamespy shut down.